MANILA - A contractor linked to controversial construction projects in Makati City will be building the new home of the Senate. Sen. Panfilo Lacson said Hilmarc’s Construction Crop. bagged the contract to build the new Senate headquarters at the Philippine Navy Village in Taguig City, located near the sprawling business district in the city. Construction is expected to take about 40 months. The Senate investigated Hilmarc’s from 2014 to 2016 for supposed anomalies in the construction of the allegedly overpriced Makati City Hall Building II and the Makati Science High School building. Critics of then Vice President Jejomar Binay accused him of rigging the bidding to favor Hilmarc’s. “I don’t want to say it’s a blessing in disguise, but during the bidding, kasi 8 ang unang nag-bid. And then sila ang nanalo,” Lacson told reporters on the sidelines of the the groundbreaking of the new Senate building Monday. Lacson said the Senate is eyeing to start holding sessions in its new home by 2021 or in time for President Rodrigo Duterte's last State of the Nation Address. He said arrangements can be made in case the President would opt to hold his last SONA in the new Senate building, noting that the annual report to the nation is traditionally held at the Batasang Pambansa, home of the House of Representatives. The new Senate building may also accommodate 65 senators, Lacson said, in case the country succeeds in its shift to a federal form of government under Duterte. He added that Senate leaders would closely monitor the building of the new structure to ensure that it is finished on time. “What we’re after is a Senate building that we can call our own which is iconic, secure, and functional. We’ll be there every step of the way. Sinabi rin namin sa kanila babantayin namin 'yan (We told them we will monitor the construction). So it can even take them less than the designated timelines na sinabi nila (which they promised),” Lacson said. The new Senate building will be a "green building,” occupying a total of 131,500 square meters of land, Lacson said. This is nearly three times the size of the current 44,000-sqm property the Senate is renting at the Government Service Insurance System headquarters in Pasay City for an annual fee of P127 million. 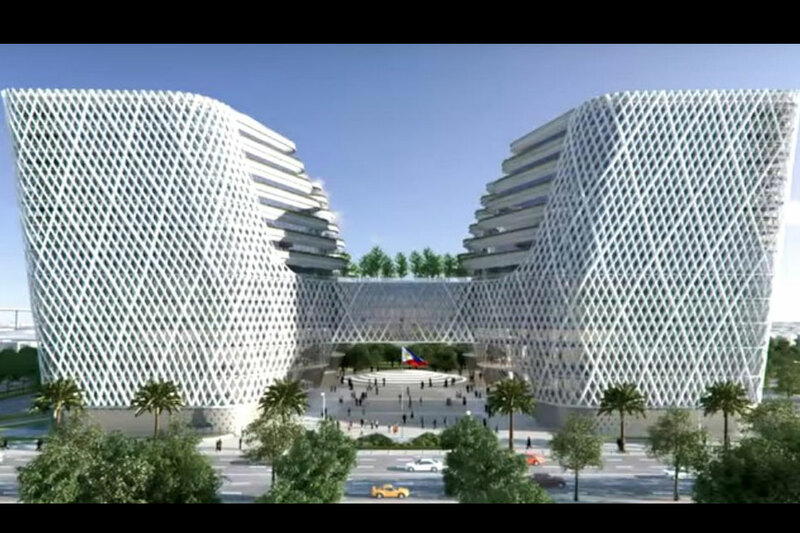 The futuristic P8-billion, 11-story structure was designed by American engineering and architectural firm Aecom. It will be comprised of four towers and three levels of parking space enough to accommodate 1,200 cars.